We’ve all spent far too much time with vampiric free-2-play games which are obsessed with harassing us for in-game purchases. 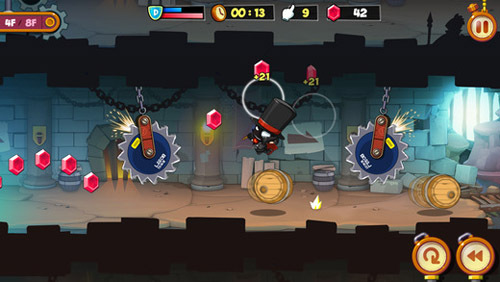 Especially parasitic examples – games like Candy Crush or EA’s Dungeon Keeper – have given the freemium business model a terrible reputation, with the result that many of us dismiss anything of the sort the moment it hits the App Store. South Korean developer Bluewind deserves credit then, for creating a free-2-play puzzle platformer which is genuinely worth playing, even without spending a cent. 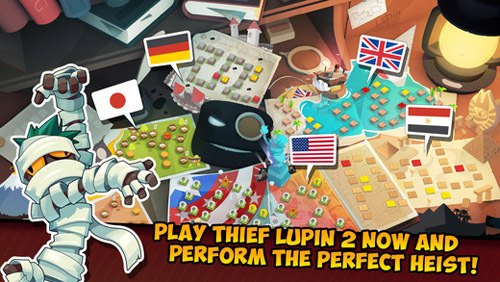 Loosely related to the classic thief tales of Arsène Lupin, Thief Lupin 2 is a brilliantly conceptualized touch-based platform game wrapped up in a gorgeously animated gameworld spread across iconic environments. On face value you could call it a free-runner, but Bluewind has done a fantastic job of implementing a touch interface into something far more complex than what you’re accustomed to from the genre. Your endearing little character is sent from Germany to Egypt and beyond, taking on level after level of cleverly crafted puzzle segments – each a little more complicated than the last. There are signs of impeccable game design here, evident in the perfectly tuned learning curve from start to finish. Puzzle platformers of this sort can quickly self destruct as the developers crank up the complexity for complexity’s sake. 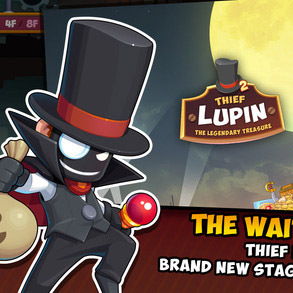 Thief Lupin 2 is expertly balanced: there are challenging moments, for sure, but you rarely feel out of your depth. The limitations of a touch interface mean that your character’s move-set is trimmed down to one key ability at a time – as you traverse the bite-sized stages, you’re only given the specific moves required to finish the level. In some you can only jump directly upwards, in others you’re able to stop dead with a tap-hold and then leap backwards when you lift your finger, sometimes your jumps can be longer or shorter based on how long you hold your touch, and so on. The brilliance comes in the way that Bluewind has woven these basic control ideas into the charming puzzle sequences. Leaping over exploding barrels, triggering switches and unlocking barriers, your objectives are always clear, but require some forethought and precise timing for success. The freemium nature of the game doesn’t cripple your progress nearly as often (or ruthlessly) as we’ve come to expect from free-2-play titles. Yes, you’re still heavily urged to buy power-ups and the obligatory in-game currencies to expedite your progress, but there’s more than enough fun to be had without digging into your cash reserves. It’s a game which strikes a wonderful balance between simplicity and crafty design; there’s a big game here too, with an unusually soft pay-wall to slow you down. 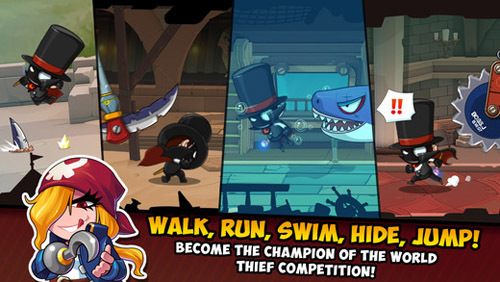 Delightful to look at, and with gameplay that challenges and charms in equal measure, Thief Lupin 2 is one of the few freemium games which is truly worth your time and effort. Requires iOS 6.1 or later. This app is optimized for iPhone 5.